Faced with a tree in need of a heavy pruning, first picture the finished work in your mind. An apple tree for example requires a strait central trunk with one, two, three, or more levels like a wedding cake or chandelier. 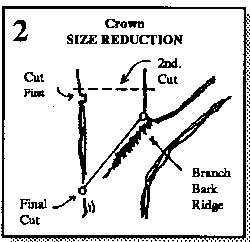 Remove congestive branches starting with the big cuts first. Second, establish the number of levels (apple) or the shape the tree will have. 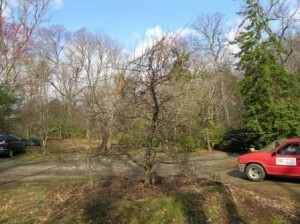 In this example the apple tree has three levels or tiers. Next establish a separation of branches from the ground to the first tier, a separation from the first tier and the second tier, and a separation between the second tier and the final third tier or top level. Finally prune all remaining branches so there are no deadwood, broken or diseased limbs, crossing and rubbing stems, and thin out any remaining congested areas. If it appears you have taken to much out ,don’t worry it will all grow back in time, especially if you follow my instructions on root zone maintenance. Contact Habitat Services for a consultation. Call now (434)-296-3327 or email shbs@habitatservices.net. 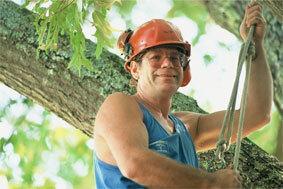 Early spring is a particularly important time for the trees and shrubs in your yard. Because of plants’ yearly life cycle, it’s a good time to prune, plant, transplant and mulch. Here are a few important tips to help you make the most of your spring landscape care. Necessary pruning should be done as soon as can be managed. 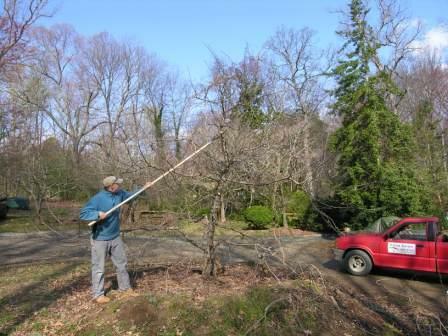 When pruning large amounts of foliage or more than one third the crown mass, pruning is best done in the cool spring and avoided during the hot dry times of the year. On June 2, 1989 a storm struck Cismont. Meteorologists called it a microburst and like a wave of hurricane winds it proved to be the most destructive storm I ever witnessed. Countless numbers of trees were damaged and numerous downed trees blocked several miles of highway. As a tree surgeon seeing this event I was awed by the massive destruction of trees and feared personal injury. This storm was exceptional, however damage from a passing storm occurs often. Here are some helpful tips to minimize damage and injury when a storm strikes. 1. Assess the damage cautiously. Broken wires or hanging tree parts are life threatening. 2. Clear access to public highways. Carefully remove debris making enough space for one vehicle to pass. 3. Check on your neighbor to render assistance. An injured or isolated neighbor may need help. 4. Seek professional advice. When the emergency is over and the job of clean up is at hand an arborist or tree specialist can assist in identifying hidden hazards. The above information was provided courtesy of The National Arbor Day Foundation. Necessary pruning should be done as soon as can be managed. When pruning large amounts of foliage or more than one third the crown mass, pruning should be avoided during the dry hot months. Dead and diseased wood can be removed anytime. The best time to prune is when the tree or shrub is dormant, usually in the winter months. 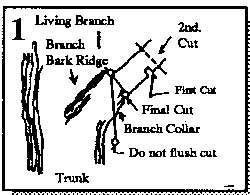 The images above show the proper way to prune. Images provided courtesy of the Virginia Cooperative Extension Service.